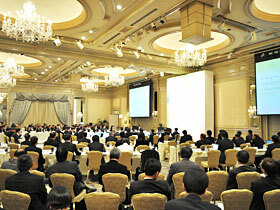 The first Asia Partnership Conference of Pharmaceutical Associations (APCPA) was held on March 16 (Friday) at the Four Seasons Hotel Tokyo at Chinzan-so (Bunko-ku, Tokyo). Out of 13 IFPMA members in Asia, this conference was attended by 12 pharmaceutical associations from China (RDPAC), Hong Kong (HKAPI), India (OPPI), Indonesia (IMPG), Malaysia (PhAMA), Philippine (PHAP), Singapore (SAPI), Korea (KPMA ), Korea (KRPIA), Taiwan (IRPMA), Thai (PReMA) and Japan (JPMA). In addition, observers from IFPMA, PhRMA, EFPIA, Interpharma, MHLW and PMDA were also there to participate in the conference, bringing 170 participants together in total. During the morning, the participants made presentations focusing on the actual situation and challenging issues in each association was facing, which were followed by the relevant questions and answers. In the afternoon, views and opinions were actively exchanged at the round table discussion on two themes; "Regulations and Approvals" and "Drug Discovery Alliance," based on the presentations made in the morning session. At the end of the conference, APCPA made proposals on the establishment of working groups, working on/reaching out to the Government of each county and the necessity of JPMA’s leadership in the efforts. 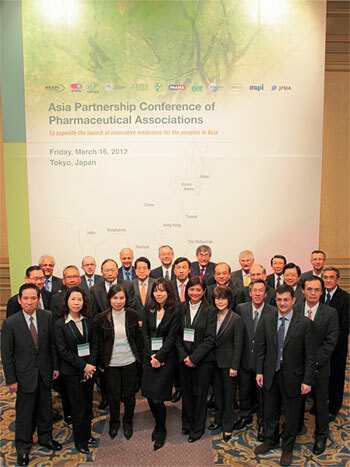 Mission: "To expedite the launch of innovative medicines for the peoples in Asia"
Goals: In order to realize this mission, we will share information regarding the challenges faced in each country and build a platform to transmit all necessary proposals of the Asia Partnership Conference of Pharmaceutical Associations (APAC) as necessary. The pharmaceutical associations of each country will propose solutions to their governments and other stakeholders regarding the pharmaceutical-related challenges of each Asian country. Promotion of open innovation in Asia to realize "drug discovery that originates in Asia". The APCPA will continue to meet regularly. The first APCPA ended with a great success, promising to meet at the second conference again.